Beyond Minimoogs, IK’s SampleMoog is the most ambitious, officially-sanctioned attempt yet to preserve the sounds of Moogs past. Photo: d-stop, via Flickr. How do you make the Moog legacy of instruments accessible — assuming you can’t afford a studio full of vintage gear? One choice is to model the instruments virtually, as developers like Arturia have done. That provides real-time control, but models may not be perfect, and if you want more than one instrument, you really need more than one model. Others have reimagined some of the Moog sound designs on more modern instruments, as Craig Anderton did recently with Cakewalk’s Rapture. IK Multimedia, working with veteran sample house Sonic Reality in collaboration with Moog Music, have taken the “museum” approach — put samples of everything in a single box. And what an ambitious collection they’ve got, as we noted when the product was announced. But can you win over even someone who owns some of the real gear? We put that question to our own Lee Sherman, who’s been diving deep into the tool. Mindful of the tradeoffs, he’s got some insight into just how useful they were able to make that sampled content. SampleMoog can’t help but be greeted with some degree of skepticism. Even virtual analog synths like Arturia’s Minimoog V don’t go all of the way in reproducing the Moog experience. How can something based on samples even come close? Moog users have always valued pure analog sound and the ability to shape that sound in real-time — the opposite of what you get from a digital, sampled library full of presets. Moog synth layouts are intuitive and interactive, and can produce any sound you want, in real-time — a capability so respected Moog users will even consider the latest Moog model without preset memory. Sample packages, even one as extensive as this, are limited by disk space to certain pre-determined sounds. But having recognized what SampleMoog is not, let’s talk about what SampleMoog is: the most comprehensive and up-to-date collection of Moog samples ever assembled, representing nearly every product that wore a Moog badge, from the early modulars to the Little Phatty. Historians, rejoice: there are over 1,700 basses, leads, pads and effects on offer here, including such relative esoterica as Taurus Bass pedals and the first Etherwave Theremin. Many of these instruments are quite hard to get a hold of in working condition, and they’re getting rarer by the day. There’s no question that IK are doing a service to the music community just by preserving these samples. SampleMoog is a 16-part, multi-timbral sample-based synth that can be used stand-alone or as a VST, AU, or RTAS plug-in on the Mac or PC. It includes a powerful synth engine with filters, envelopes, and LFOs and a competent, if not particularly exciting, effects section, with 32 effects (up to 4 effects per part). Regular readers will know how we feel about dongles so we’re encouraged by the lack of one here. After installing from one CD-ROM and a DVD-ROM you can run the program in demo mode for a generous 10 days before authorizing it with the supplied serial number. SampleMoog is based on IK’s SampleTank 2.5 engine, but adds a Moog-inspired 24dB-per octave lowpass filter with two AHDSR Envelopes (one devoted to amplitude and the other to filter and pitch). Combined with two LFOs (with a choice of triangle, square, saw, sine or random) waveforms, you’ve got more Moog-like filtering and modulation, without being too slavish an imitation. There are also bandpass and highpass filters with 6dB, 12dB, or 24dB slopes for variety. Velocity, Range, and Macro controls, and the ability to save layers and splits as Combis, provide more control over the final sound than is usually seen in a soundware package. The software also looks looks great, with Moog-style knobs and switches and lots of wooden trim. If it wore the Moog name and it made sound, odds are it’s in here. Photo: Tobiasz “Anorak” Koprowski. As you might expect given Sonic Reality’s involvement with the project, the sounds themselves have been meticulously sampled and the realism factor is high. Highlights here include the increasingly rare Taurus bass pedals, which are just as dark and menacing as I recall from the prog-rock of the 70s, the Rogue (the first synth I ever paid for with my own money), and an incredibly useable theremin (with just the right amount of portamento and modwheel-induced vibrato). The advantage of sampling these instruments is unparalleled authenticity — at least for the timbres sampled. While arguments rage over which virtual analog really nails the Moog sound, here that argument is moot since you’re listening to the actual sounds. As is always the case with sampling versus modeling, though, the trade-off for having those literal recordings of a variety of instruments is control. It all comes down to how the sounds were sampled in the first place. While SampleMoog does give you access to certain parameters, these parameters are baked into the recording and there are some you simply can’t affect. There’s also no way to capture some of the more esoteric qualities of analog synths such as the subtle detuning that comes from analog drift. This is hard for modelers, too, but at least some of these details can be incorporated into a model; samples are more static by definition. As a concession to the tweaks, the software also includes a folder full of raw waveforms taken from the Minimoog that you can run through the filters and effects to come up with your own sounds. While welcome, it still felt limited compared to what you can do on a real Moog, largely due to the lack of routing possibilities. Ed. : that could get more interesting, though, as hosts like Native Instruments’ Kore become almost semi-modular — I could see this making an interesting sampled oscillator source. Despite my initial snobbism, I have to confess that SampleMoog won me over in the end. This is clearly a package that has been put together with a great deal of love and respect for Moog’s legacy. The programmers were necessarily limited by the sampling medium. Because of that, rather than provide a completely open-ended palette for sound design as you’d found on an actual Moog synth, their choices as to how to shape certain sounds define the program. Moogs have been used in many musical contexts, funk, prog, and electro to name but a few. So a package like this must necessarily encompass the choices made several decades worth of Moog programers. Not to worry. Fortunately, their choices are for the most part excellent, and are entirely usable in today’s musical context. All reservations aside, short of sampling my own Moog hardware, this is perhaps the best way I can think of preserving the legacy of these incredible instruments. Be sure to watch our interview with Craig Anderton on why it’s important to preserve the Moog legacy, and how you can help by supporting The Bob Moog Foundation. 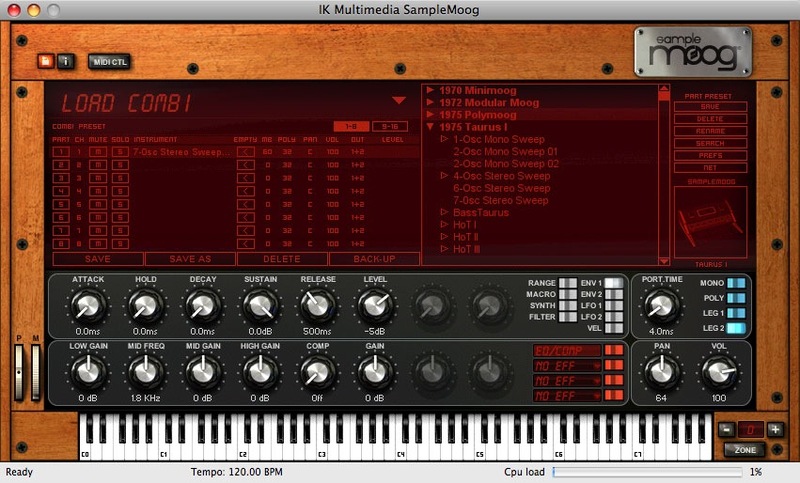 IK Multimedia is also working with the Moog Foundation with SampleMoog, so in addition to giving money or volunteering effort to the Foundation, buying and using SampleMoog also gives support to this worthy cause. See the original announcement of the collaboration, reproduced at EQ Magazine.